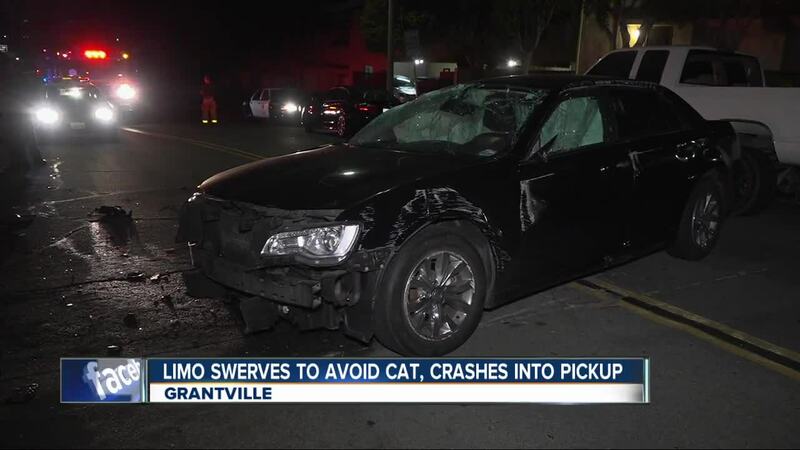 SAN DIEGO (KGTV) - A limousine driver told police a cat on the road caused him to crash into several parked vehicles in Grantville Monday. San Diego police officers responded to the wreck at around 11:15 p.m. in the 4500 block of Twain Ave. The limo driver said he swerved to avoid a cat that was in the street, causing him to hit a pickup truck and two motorcycles. The truck’s owner told 10News that the limo driver told him he was only going 25 mph when he attempted to avoid the cat. The driver was not injured, and police said they don’t believe drugs or alcohol were factors in the collision.